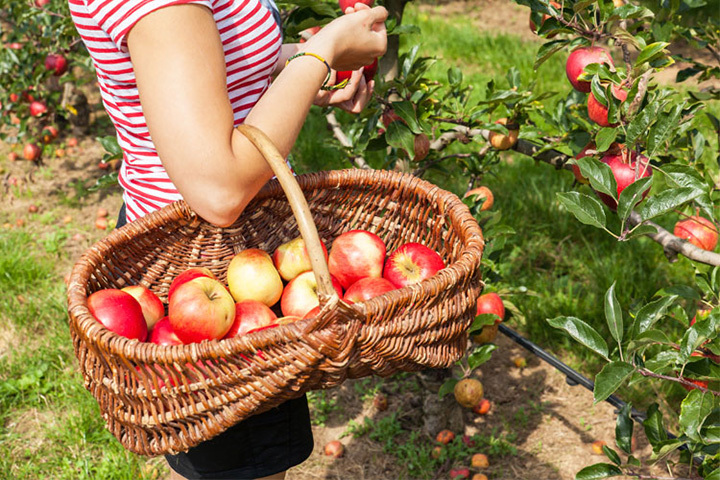 The 10 Best Apple Orchards in California! One of the most memorable and heartwarming parts of the fall? Gathering apples from your local orchard, taking them home, and whipping up your favorite recipe. Many of the locations below feature markets, festivals, tours, and other events going on during apple season. You’ll be able to spend plenty of time with your family making precious memories while gathering everyone’s favorite fall fruit! Here are the 10 best apple orchards in California. This family-owned orchard is home to a farm, winery, and cidery and is located in Oak Glen, California. Snow-Line Orchard is surrounded by majestic mountains and is at the height of its beauty during the fall months with the colorful fall foliage is painted against the canvas of the blue sky. You can purchase fresh apples in the market, and they have you-pick raspberries, famous mini cider doughnuts, local honey, wine made on premise, several types of cider, and other special gifts. Offering u-pick options mainly in September and October for organic apples like Orin, Pinova, Molly’s Delicious, and Jonathan’s Pride, Chileno Valley Ranch in Petaluma, California is also a grass-fed beef ranch. The ranch’s beginning goes all the way back to the mid-1800s, and was restored in 1993, when 400 apples trees were planted along with 200 rose bushes. Visiting children are welcome to see the farm animals and pet the sheep and cows, and feed the pigs. The ranch’s apples can also be purchased at local farmers markets and fruit stands in the area. Featuring apples, blueberries, and pumpkins that you can pick, Bolster’s Hilltop Ranch in Camino, California has been serving the community since 1964 with the same great quality fruit and vegetables. Open year-round, Bolster’s is also the perfect place for groups and educational tours, and weddings are always welcome. The beautiful orchards and colorful trees on the property make this a wonderful backdrop for photos. Imagine packing a picnic lunch and eating it under a sprawling pine tree right in the middle of an apple orchard. You can do just that at Goyette’s North Canyon Ranch in Camino, California. You can also pick blueberries, pumpkins, sunflowers, and Indian corn in season. What a great family experience this makes! Owned by the Larsen family since the 1860s, Larsen’s Apple Barn is home to some of the best apples around. Golden Delicious, Jonagold, Fugi, and Honeycrisp are just a few of the varieties grown here, and visitors can also purchase pies, turnovers, dumplings, and other yummy baked goods. Other u-pick fruits include peaches, nectarines, pears, and grapes. O’Halloran’s Apple Trail Ranch has activities for the entire family. Located in Camino, California, you’ll find the best you-pick apples, and then come back for late season fruits like pumpkins and Christmas trees in December. Always welcoming and kid-friendly, the staff will help you get started and are very good at making your feel right at home. Serendipity Farms has organic food done right. Located in Aromas, the farm sells certified organic produce and flowers, and has been open since 2001. Known for excellent produce and friendly people, Serendipity Farms goes beyond ordinary and creates fun on the farm with picking events. This cozy three-acre farm is home for you-pick and pre-picked apples, berries, and pumpkins. Also available on the farm are tours for groups, and you can even design your own tour from the list of activities like apple cider pressing, a popular favorite, corn husk doll making, corn grinding, Johnny Cake baking, and more. This is sure to be a family favorite. Typically open the first week in September, Willowbrook Apple Farm in Yucaipa, California offers the chance to press your own apple cider, eat fresh, made on the premises caramel apples, choose something from the family store, or make friends with one of the animals who live on the farm. This 100-year-old apple orchard is still producing the same great quality and delicious apples it did years ago. The drive to the farm affords one of the most scenic views in the area. Brian Ranch Airport U*Pick Orchard in Llano, California is a special treat. There are so many varieties of fruits and vegetables available for picking, that you may not know where to start. Open weekends from 8 am to 2 pm, they can also work with larger groups. Offering apples, apricots, pears, peaches, cherries, nectarines, plums, and pumpkins, you can also purchase fresh fruit butters made on premises.